Clayoquot Plateau Provincial Park is situated in the Clayoquot River drainage area, near the west coast of central Vancouver Island. The 3,155-hectare park is a high elevation plateau protecting rare plant species, undisturbed old-growth forests, fragile karst features, such as sinkholes, and numerous small lakes. This rugged, remote and undeveloped park is extremely difficult to access. It can only be reached through a series of logging roads. There are no developed trails in the park, but determined visitors will find a pristine forest of Sitka spruce, Hemlock and Cedar. Spectacular views of Clayoquot Sound can be enjoyed from the Plateauâ€™s summit. To the East, the park is bordered by the Kennedy River, which provides good swimming and fishing. Hiking is possible from the day-use recreation area. There are no other facilities available in the park. Clayoquot Plateau Provincial Park contains an extensive cave system suitable for exploration by experienced cavers. However, the area is sensitive and unmanaged and its use is not recommended until a plan is complete. 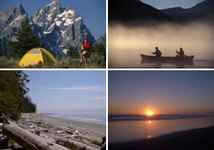 Clayoquot Plateau Provincial Park is one of several parks within the interior of Clayoquot Sound, a magnificent, biologically rich, mostly wilderness area on the west coast of Vancouver Island, which encompasses 350,000 hectares of land and ocean. The other parks include Clayoquot Arm, Clayoquot Lake, Kennedy River Bog, Kennedy Lake, Tranquil Creek's headwaters, Hesquiat Lake, plus several smaller coastal areas such as Dunlap and Morfee islands (in Epper Passage Provincial Park), Dawley Passage and Lane Islet. There are no designated campsites, however random wilderness camping is allowed. No facilities are provided and there is no fee. This park is open year round, however roads may become inaccessible due to snowfall. There is no fee for backcountry camping. 1.Snow comes early and melts very late in the season. 2.Bears, wolves and cougar may be present anywhere in the Sound. Do not bring pets into the park and never feed or approach bears or other wildlife. 3.Be prepared for cold wilderness conditions, even in the summer. Bring emergency equipment and spare clothing. "Clayoquot" - pronounced Klak-wot - comes from Tla-o-qui-aht, the name of one of the First Nations tribes who lived there. The park lies in the traditional territory of the Tla-o-qui-aht First Nation. Their connection to this land is a vital, driving force and visitors are asked to respect this connection. Access to Indian Reserves is prohibited unless permission has been obtained from the band office.